The cherry blossoms are well past their prime now and on their way out, but as of this morning there are still plenty of flowers to see. After a sudden surge leading up to peak bloom, they're now taking their time. A few trees are mostly green leaves. A few are mostly covered in blossoms. The majority of the trees are somewhere in between. It's a gorgeous spring morning and very quiet down around the Tidal Basin. There are quite a few joggers, not many photographers, and one happy couple who just got engaged around sunrise with a "marry me" proposal crafted out of fallen cherry blossom petals. We had rain on Tuesday, but since then there hasn't been much in the way of wind, which has helped prolong the process (or, at least, not hurry it along). So the flowers are hanging around longer than they did last year. They're very fragile at this stage and can be knocked off with wind or rain. Over the next days they'll disappear. But not every tree is on precisely the same schedule, and even in trees standing right next each other you can find neighbors looking very different because one still has flowers and the next has dropped them all. Because of that, there might be some stragglers still with flowers on them over the weekend, but the majority are well on the way out. The traffic restrictions on Ohio Drive have been lifted (signs warn of roadwork on April 20), and the parking lot off Maine Ave has reopened. Here are some photos from this morning that will give you some idea of what to expect if you head down to the Tidal Basin today. 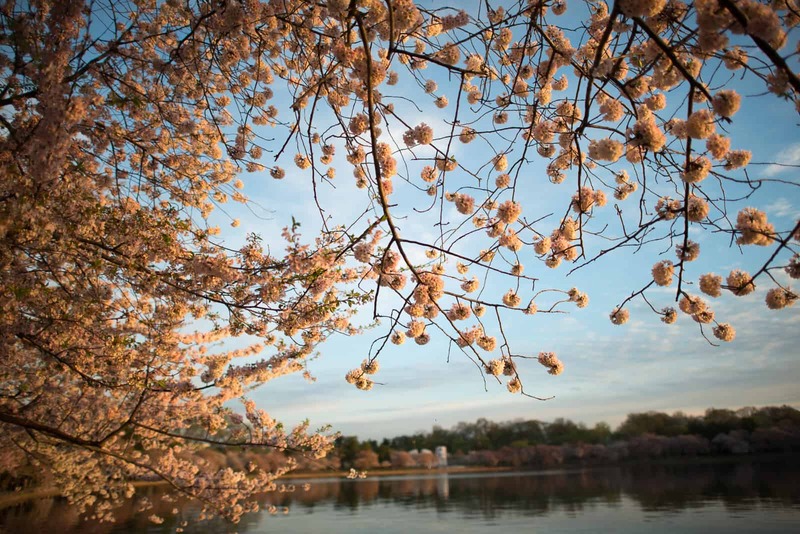 For the most part, the Kwanzan Cherry Blossoms aren't yet blooming, but it is possible to find the occasional flower that's open on some trees. You can find more on the Kwanzan cherry trees here, including where to find them. These are the tulip magnolias (also known as saucer magnolias) over near the George Mason Memorial. They started blooming ahead of the cherry blossoms and are still looking lovely, although as you can see from these (and the many others you'll come across around town), they're getting past their prime and the petals are coming off. Thank you so much for the detailed post! So very helpful! We were planning to see them tomorrow (17th April) do you think it's worth making a trip to DC from NYC? do you have any other suggestions about places to visit instead for cherry blossoms?? Sorry I meant Saturday the 18th in my Comment. I'm afraid I haven't been down there since Thursday and haven't seen how they're doing since then. Thank you for your wonderful updates! I live in Syracuse NY and have traveled to DC for many years to see the blossoms. I was unable to make it this year to see them but have so enjoyed your beautiful pictures. I too enjoy all of the blossom stages and uniqueness of each. I'm glad I could live vicariously through your pictures. Now that I have found your updates I look forward to your tracking next year. Thanks again! I finally went down to DC today. The flowers are beautiful, especially the tulip magnolias! Glad I was able to see some cherry blossoms before they are gone. I really love your photos! They aren't even close to the pictures I took. Thanks again for the updates! Thank you for the detail update. Even we are not in DC yet but we feel we share all the wonderful cherry blossom season with you. David, I want to first 'thank you' for keeping us up to date on the statuses of the cherry blossoms over the course of these past two and half weeks. They were faboulous!! 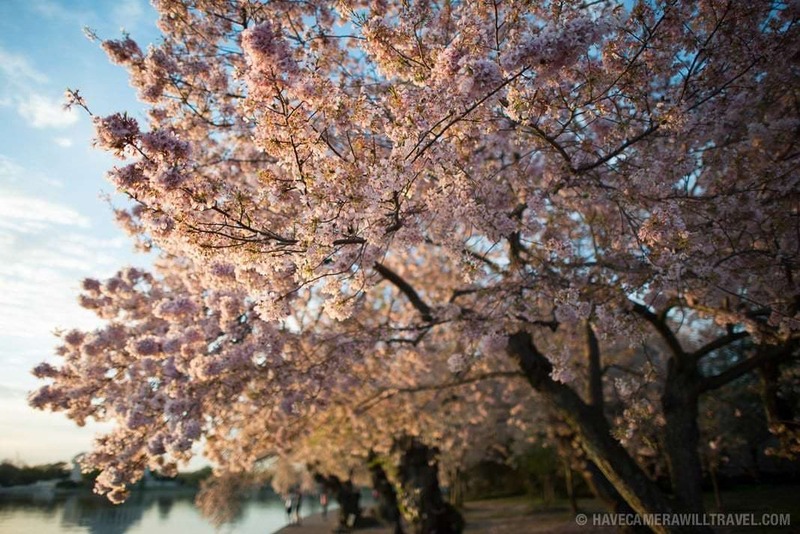 Please continue to update us on the kwanzaa cherry trees, I don't know how many of those trees are planted around by the East Potomac Park but, I would like to see it! There are over 400 over next to East Potomac Park and about 40-ish around the Tidal Basin area. I won't be updating nearly so often but will try to catch the Kwanzans when I can. Can I please say thank you so much for all hard work and effort that goes into these daily cherry blossom reports? Thank you so very much! You have made those of us traveling there well prepared! You're very welcome. Glad it's helpful!